That latest snow prediction was just a farce, right? (From L-R:) Chavet Sauvignon Blanc, "Gruet-Brut Sauvage" sparking Blanc des Blanc and Stein Rose. If you're as ready as I am for sunnier days, bluer skies, picnic-bound excursions and bike rides down the Schuylkill, I recommend that you find yourself a bottle of these spring beauties! They are sure to warm spirits and remind us that a season change is on the horizon. Though at times it may seem like winter will never leave us, (i.e. that March 7th Nor’Easter); these wines, singing with notes of green grass, fresh cut flowers, ripe fruits and citrus, will give us all something to look forward to as we wait for spring to arrive. If green beer isn’t your jawn either, pack some wine to-go to celebrate this city’s strong Irish heritage. “Gruet-Brut Sauvage” is a sparkling Blanc des Blancs (100% Chardonnay) from New Mexico that will get you into the festive spirit. This sparkler embodies notes of lemon curd, red apples, toasted bread and has a long, salty finish. Share with friends and this “foamy latte” will satisfy all palates. Pairing scenario: If your Irish grandmother, like mine, still makes corn beef and cabbage for dinner on March 17, this will cut through those – let’s say – strong flavors. When the stars align, we get a few really warm days in March. It’s the kind of sunshine that makes me want to throw on a pair of jorts and cruise on my Schwinn through the city’s bike paths. Throw a chilled bottle of white in your bag and enjoy at your nearest park. I recommend picking up a bottle of Sauvignon Blanc from winemaker Chavet. Chavet is located in Menetou-Salon, which is essentially Sancerre’s friendly neighbor to the west. 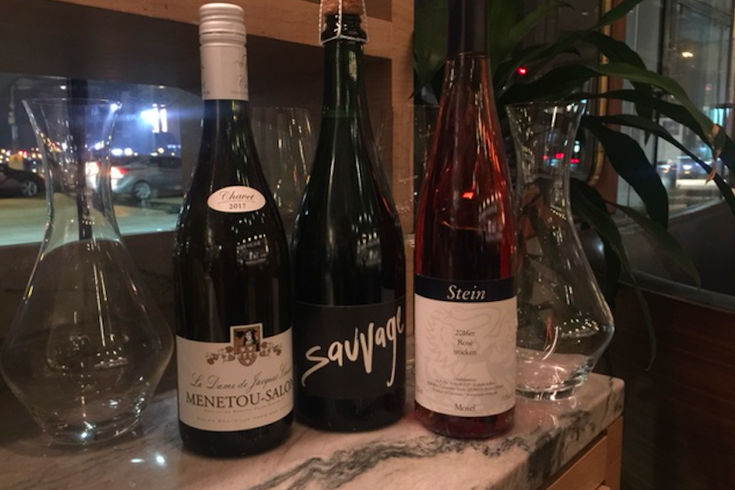 Because of its less recognizable AOC name, Menetou-Salon designated wines boast good quality at a great value. This one has notes of fresh grass and juicy mango with a zippy finish. Just when we thought the days of the bomb-cyclone were behind us, it’s snowing again. Fear not! We have the right wine for this occasion. I suggest curling up to a fuller style rosé like Stein, Pinot Noir Trocken Rosé from Mosel, Germany. Passionate winemaker Dr. Ulli Stein sources these Pinot grapes, along with some Cabernet and Merlot that also go into the blend, from super steep vines. His wines are juicy! Bright cranberry and raspberry come through with notes of hibiscus. At about 11 percent alcohol, this wine is crushable. Save half the bottle for the next day, because just like March, a full rose is suited for both cold and warm weather. Can’t get your hands on a bottle of Stein, look for rosés with a darker hue, an indicator of body the wine will possess. Kaitlyn Caruke is the head sommelier at Walnut Street Café and a board member of Philly Wine Week.